Written by Amy Hoover for FBLE. The Senate farm bill that advanced out of the Ag Committee on Wednesday, the Agriculture Improvement Act of 2018(designated S. 3042), misses key opportunities to reorient federal policy toward goals of long-term agricultural productivity and risk management. Although the bill makes modest improvements to better target resources toward stewardship priorities, it fails to reform a structure that disproportionately benefits large, consolidated farms at the expense of smaller-scale farms, taxpayers, and the environment. This blog post compares S. 3042 to FBLE’s recommendations in the report Productivity and Risk Management. Instead of advancing FBLE’s commonsense recommendations to level the playing field among farmers and invest in soil and water, S. 3042 maintains a troubling status quo. The Senate misses key opportunities to better align farm bill incentives with shared values of resiliency and fairness and to redirect funding toward rewarding good stewardship practices. For example, the Senate bill runs counter to FBLE’s recommendation to ensure that crop insurance programs promote sound risk management practices. Federal subsidies for crop insurance help farmers succeed despite the uncertainties inherent in agriculture. But the core features of the federal crop insurance program, which are unchanged in the Senate’s bill, go too far in sheltering farmers from risk. Programs that provide very high premium subsidies and coverage perversely encourage farmers to engage in risky behaviors, such as planting on marginal land, while taxpayers shoulder the downside costs. To promote sound risk management and eliminate windfall payments, FBLE recommends placing per-acre limits on federal crop insurance subsidies and reforming both the Harvest Price Option and Supplemental Coverage Option. The Senate missed its opportunity to rein in risky behaviors by leaving current programs unchanged. S. 3042 also misses key opportunities to increase fairness in public-private crop insurance administration. Under the current farm bill, which the Senate leaves unchanged, companies that administer federally subsidized crop insurance benefit from guaranteed profits much higher than the average reasonable rate (14.5% guaranteed, compared to the average reasonable rate of 9.6%). The structure of the public-private partnership also encourages insurance companies to overspend on administrative and overhead costs. FBLE recommends placing reasonable limits on insurance companies’ guaranteed profits and administrative budgets in order to improve fairness. The Senate bill instead uses taxpayer dollars to perpetuate an unfair system. The Senate bill fails to take meaningful steps toward structuring farm program payments so that they support farmer livelihoods, rural communities, and natural resources stewardship. Today, commodities and crop insurance programs advantage producers that seek maximum scale and yield at the expense of rural communities and their environment. The largest 10% of farm operations receive 68% of all insurance subsidies, and the largest 2% of farms receive 4 times more per acrein subsidies than the average farm. FBLE recommends that the Senate provide more equitable support in the crop insurance program by using means testing to limit crop insurance subsidies to the highest-income farms and limiting crop insurance premium subsidies per acre, but S. 3042 leaves these programs unchanged. On the commodities side, the Senate took a small step toward increasing fairness for farms of all sizes by reducing the adjusted gross income cap for commodity payments from $900,000 to $700,000. Although small, this change aligns with FBLE’s recommendation that Congress free up baseline budget through commonsense commodities reform. The current draft of S. 3042 fails to make critical updates to conservation compliance requirements. These requirements are intended to guarantee minimum conservation standards on farms receiving farm bill subsidies, but serious deficiencies in compliance implementation and enforcement undermine the program’s effectiveness. These deficiencies remain unaddressed in the Senate bill. 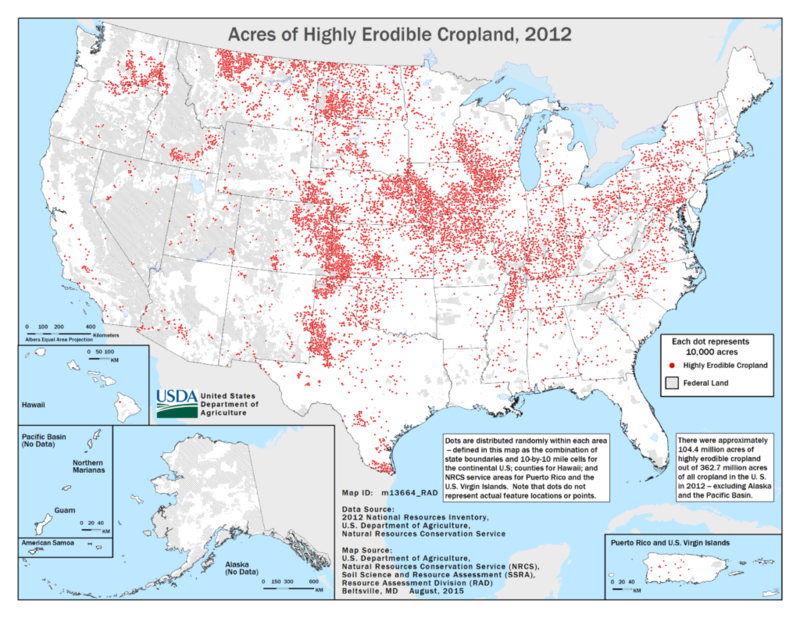 NRCS map of highly erodible crop acres subject to conservation compliance requirements. On USDA-designated highly erodible lands and wetlands, farmers must comply with basic conservation measures in order to receive federal crop insurance subsidies and commodity payments. However, current conservation compliance requirements fail to cover many types of vulnerable land, and where they do apply, they still allow erosion at unsustainable rates. USDA is not required to report conservation compliance data in a meaningful format to either Congress or the public, so a lack of data hamstrings efforts to understand and improve program effectiveness. Furthermore, a recent report from the National Sustainable Agriculture Coalition reveals that USDA is not adequately monitoring or enforcing compliance requirements. Whereas FBLE recommends increasing transparency in the conservation compliance program, updating standards to protect more soils, and funding robust enforcement and technical assistance for these standards, the Senate leaves this inadequate system unchanged. Since the bill does not provide funding for USDA to better address conservation compliance, USDA will remain unable to enforce compliance standards or provide farmers the support they need to comply. The Senate’s action on Sodsaver, a program to protect native grasslands, provides a model for improving conservation compliance. An amendment to the Senate’s original bill allows Sodsaver to expand nationwide (subject to state approval) and includes reporting obligations that could also be applied to conservation compliance. Expanding Sodsaver’s model for reporting to conservation compliance would better align with FBLE’s recommendations. The Senate farm bill adopts key FBLE recommendations to move voluntary conservation programs towards the most effective stewardship practices but cuts funding to core conservation programs. S. 3042 modifies voluntary conservation programs to better target funding to where it is most impactful. Currently, the benefits of conservation programs can be lost when land returns to production. The Senate bill improves opportunities for permanent conservation by enabling easier enrollment in permanent easements and re-enrollment in conservation activities. The bill also restores funding to ACEP, an easement program. 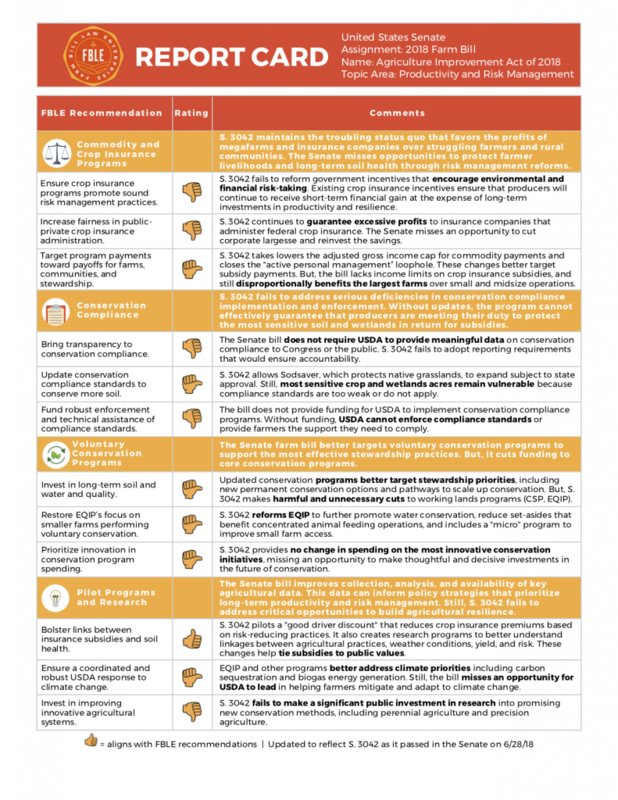 The Senate bill enables farmers to scale up their conservation activities with a pathway to graduate from EQIP into the more rigorous CSP and adjusts RCPP priorities to better address local concerns and critical conservation. All of these changes align with FBLE’s recommendation to modernize conservation programs. The Senate bill also advances FBLE’s recommendation to restore EQIP’s focus on smaller farms performing voluntary conservation. In S. 3042, EQIP better encourages water-protecting conservation, reduces set-asides that benefit concentrated animal feeding operations from 60% to 50%, and includes a “micro” program that will improve EQIP access for smaller-scale producers. Despite these improvements to conservation programs, S. 3042 also makes harmful and unnecessary cuts to working lands programs. Funding for both CSP and EQIP are reduced in the bill. FBLE recommends that alongside better targeting, these programs should also have strong funding support. The Senate farm bill also fails to invest in innovation. Whereas FBLE recommends prioritizing Conservation Innovation Grants to spur advances in state-of-the-art conservation techniques, S. 3042 maintains the status quo for program spending. The Senate bill adopts key FBLE recommendations on data collection, analysis, and availability. This data can inform policy strategies that prioritize long-term productivity and risk management. Still, the bill fails to address critical areas for agricultural resilience. Aligning with FBLE’s recommendation to bolster links between insurance subsidies and soil health, S. 3042 pilots a “good driver discount” to reduce insurance rates based on risk-reducing stewardship practices. It also creates research programs to better understand linkages between practices, conditions, yield, and risk and provides data access to researchers. These steps lay a strong foundation that will enable future farm bill programs to target funding to support the most effective practices. Still, S. 3042 falls short when it comes to moving U.S. agricultural systems forward into a changing future. As farmers face increasingly uncertain weather, shifting growing seasons, and other climate change impacts, FBLE recommends that the farm bill ensure a coordinated and robust USDA response to climate change. In individual programs, the farm bill takes small steps toward climate-conscious practices, including by promoting carbon farming in EQIP and including carbon sequestration and biogas generation in energy programs. But, by failing to seize a leading role on climate change issues, USDA misses an opportunity to clearly and effectively help farmers mitigate and adapt to climate change. Furthermore, the Senate bill fails to invest in key areas of innovation. S. 3042 fails to address perennial agriculture, precision agriculture, and livestock predation. Research and pilot programs in these areas would address FBLE’s recommendations to advance farming practices. Although the Senate’s farm bill takes small steps to better target federal investment in stewardship practices, it largely maintains a troubling status quo in farm bill programs. Overall, farm bill programs addressing productivity and risk management in S. 3042 continue to reward farm expansion and consolidation at the expense of smaller-scale farmers, taxpayers, and the environment. Still, as S. 3042 moves to the floor, opportunities remain to better align the Senate bill with FBLE recommendations. An anticipated floor amendment closing the “active personal management” loophole would better direct taxpayer dollars away from megafarms. Restoring full funding to CSP would better support our nation’s most effective conservation program and demonstrate the Senate’s commitment to a resilient agricultural system. If any of this happens, look to hear from us about it on an upcoming FBLE blog post.